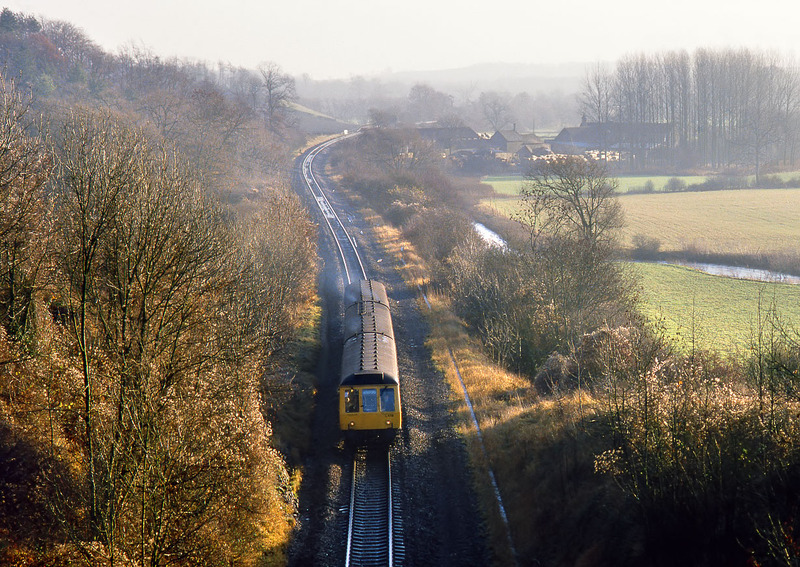 Viewed from the very tall Grintleyhill Bridge, L418 (51355, 59507, & 51397) passes Combe on 7 December 1985 with the 2B60 09:01 Didcot to Hereford service. This is an interesting view, as it shows much more of the surrounding countryside than can be seen today. Just visible in the background where the track disappears from view is the wooden platform of Combe Halt (which the train has not called at). Combe Mill, which houses a Victorian steam sawmill, and is now open to the public, is in the background, and the River Evenlode completes the scene, as it meanders through the fields in the middle distance.